?We have always loved the Ulysses,? says the Texan shop’s Alan Stulberg. ?It?s an inexpensive, capable machine with plenty of reliable horsepower and torque on tap at any time. ?Sure?Ulysses S. Grant helped squash the ‘Rebel Yell’ of the Confederates, but we found the irony played out well with our bike of choice.? 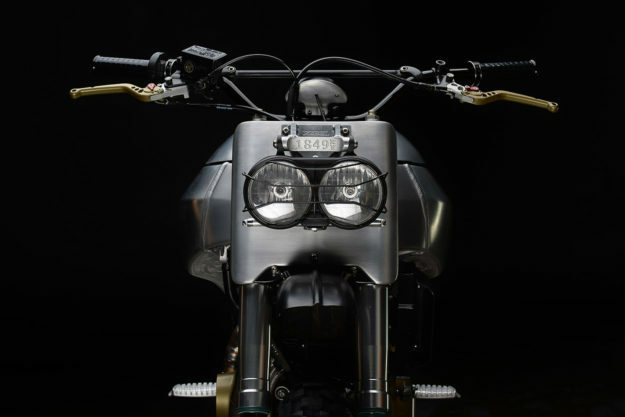 The Ulysses is the closest thing to a dual-sport bike that’s ever come out of Milwaukee. But it’s no hard off-roader. Revival?s version?dubbed ‘The Bueller‘?is an entirely different animal. ?Our goal for this build was to keep the budget in line, as we didn?t have much room for error,? says Alan, ?and to prove that you can properly jump, air and land a bike of this heft.? ?All too often, we see other builders simply putting knobby off-road tires on every street bike out there, from a vintage inline-four Japanese bike to a modern 160 horsepower Ducati superbike,? says Alan. ?While entertaining and fun to look at, this does not make an off-road bike?or even an ?adventure? bike.? ?We sell and install more high-end gadgetry from Motogadget than anyone else in the world,? says Alan. ?The tidy nature of the Buell frame, and our reworking of the design, has resulted in a subtle and almost invisible installation of the modern technology. ?